Tim and I woke late, having stayed up into the wee hours of the morning reading, and headed down for the breakfast that’s included in our 35 lira (about $26 USD) per night room. Breakfast, as always, was scrumptious: the freshest tomatoes and cucumbers you’ve ever seen, two homemade jams, two homemade cheeses, wonderful bread, apple tea, walnuts, apples, and the best nectarines we’ve ever tasted. There is no doubt that Turkish people know their breakfast. Shortly after eating, we head out into the sleepy town of Göreme. Surrounded by fairy chimneys and the call to prayer coming from the local mosque, we are happy as we’ve ever been. Today we’ve decided to explore the second part of a local valley called Love Valley. A few days prior we had walked down one arm of it, and we were excited to see the other half of it today. 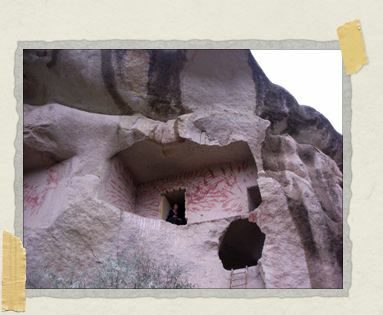 On the walk out of town, we pass our favorite restaurant in Göreme. It’s just a little place that’s filled with cushions and carpets and everything that is comfortable, and it has some of the best food we’ve ever tasted. During our time in Göreme, we’ve spent many hours there enjoying the food and being taught how to play backgammon (which just may be the national game of Turkey) by the two waiters who speak “small English.” Just as we pass their door, Tim’s backgammon coach/waiter comes outside and cheers “Champion!” to Tim. (Tim and his coach have won a few more games than me and my coach). He asks us where we are going and invites us inside for a cup of tea. We tell him we’re just headed out for a walk, but promise that we’ll come have tea when we’re all done. The walk to Love Valley is only a short 0.5 kilometers from the edge of town, but it’s a really nice one. 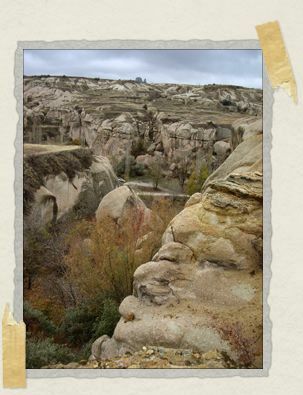 We walk just around a bend, and suddenly we are afforded gorgeous views of hundreds of fairy chimneys and other out-of-this-world rock formations. It looks like something from a movie set, and we have to remind ourselves that this is real and we’re actually here. We pass a sign for the Tourist Hotel and are amused to see that several more of its letters have disappeared since the last time we walked this way. It seems the local kids are collecting letters for some unknown reason. Shortly past the sign, we turn right onto a dirt path and start following it to Love Valley. About 300 meters down the path, we pass the sign for “The Church of the Evil Eye.” While it may sound a bit ominous, evil eyes are considered very good luck in Turkey and hang from just about anything you could hang something from. The other time we had walked through Love Valley the church was closed, so we decided to have another go at it today. 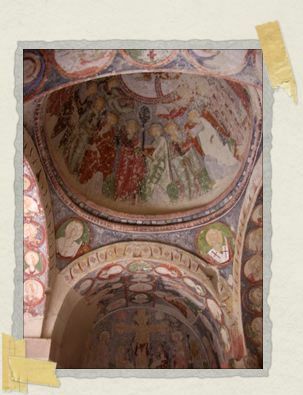 We had read that it had some wonderfully preserved frescoes on the inside. Amused that he has deemed us “Turkish children,” our host invites us to sit down at his desk. He makes sure to point Tim to the chair on the opposite side, and invites me to sit right next to him. (Whereas travel in South America meant any men we spoke with usually preferred to address Tim, in Turkey I’m the one who gets all the attention. It’s definitely an interesting cultural note.) Once seated, it’s only then that we notice the rest of the ticket office is in fact a small one room apartment of sorts. It includes a single bed, a pantry located in one of the niches in the wall, and a tiny kitchen area (which is more like a hot plate and a tea kettle). Our host, whose name we learn is Mustafa, points to the sandwich on his desk and then to the pantry, offering to make us a sandwich. We point to our stomachs and say that we’re very full. And so instead he offers us tea (to which we happily agree) and also digs around in a filing cabinet for his secret stash of fresh walnuts. And thus begins our afternoon tea with our new friend Mustafa. And even though we speak little Turkish and he speaks little English, we learn quite a bit about one another while we’re there. At one point, he shows me the tickets that are 5 lira (for adults) and the tickets that are 2 lira (for Turkish children) and he giggles again as I nod and reassure him that Tim and I are, indeed, Turkish children. He holds his finger up to his lips, making a “shhhh” sound, and we do the same, reassuring him this secret is safe with us. Later, Mustafa goes to have a cigarette and I jokingly “tsk tsk” him while pointing to the “no smoking” sign in his cave. And then I hold my finger up to my lips and make a “shhhh” sound too, which amuses Mustafa to no end. After tea, he puts on his coat, grabs the key to the church, and the three of us walk over to the Church of the Evil Eye. Inside, Mustafa points to different murals and tells us what they are showing. And like tea, it’s a very special moment. Being privately shown an 800 year old church by its guardian is something you only read about, not something that happens to you. And yet, there we are, with Mustafa happily pointing to the murals and us standing in awe of them. Having viewed all the murals, we thank Mustafa again and again for everything, and he points to the valley and then to himself, and asks that we visit him again after our walk. We promise we will and begin the walk to Love Valley, with kind Mustafa looking on from the steps of the church. Our approach this time to Love Valley is different than our approach from our first walk there. This time, rather than walking through the valley, we are walking above it. Our perspective gives us a bird’s eye view of the rock formations that begin on the valley floor 60 feet below us, and we are not shy about taking picture after picture of the gorgeous views. About 30 minutes into our walk, we find a rough path of sorts that leads down to a part of the valley we have not yet explored. Navigating down the crumbling walk and under the berry bushes, we finally reach the valley floor where we’ve stumbled into an orchard of sorts, the smell of fresh apples all around us. We are completely alone and surrounded by gorgeous cliffs on either side. And we truly are in another world. We continue walking for another 30 minutes, over fallen trees, around prickly branches, and through the occasional tunnel formed by some of the stunning rocks towering all around us. It’s mid-afternoon at this point, and another call to prayer starts to float into the valley from the mosque located back in Göreme. It’s a gorgeous sound, one that we never tire of hearing, and one that is made even more beautiful as it echoes off the cliffs all around us. 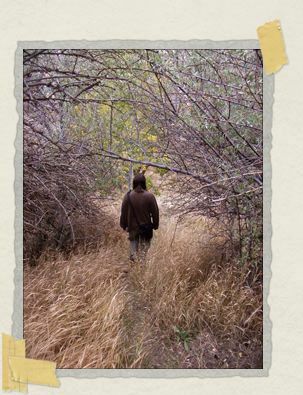 The path we are walking on is very overgrown. Judging from the lack of other footprints, it hasn’t been walked on in quite some time. And we delight in this fact, knowing that we’re seeing some things that many people don’t get a chance to see. Göreme is truly stunning in that way: pick a direction, and it’s likely you’ll find a path that someone else hasn’t walked on before. After a bit more time, we realize it’s growing late and it feels like it might start to rain. And so we turn back for the walk home, remembering we need to pop into Mustafa’s place to say goodbye before we go back into town. But when we’re only about 10 minutes from Mustafa’s place, we notice an old church carved into the side of the cliff on our left. We had seen it a few days earlier, when we had walked this part before, and had remained curious about it. From the outside, we could see there were a few frescos, and we could also see a 24-rung ladder leading up to its lofty entrance. And so after a moment’s pause, we decide to go and explore. It takes a few moments for him to reach the top, and once he does he disappears into a small door to his left. Although he’s very high up and inside the cliff, I can hear the echoes of his voice moving slowly through a tunnel. And then suddenly, he appears in another doorway to the left. He mentions there’s yet another tunnel left to explore, and before disappearing into it declares that his new-found tree house (or cliff house, perhaps) is the coolest thing he’s ever seen. Curious, and already reassured there are no crazies up there, I begin to climb the 24-rung ladder to the entrance as well. The church is absolutely amazing, there’s no doubt about it. There are several rooms, some quite large, many with various frescos of sorts decorating their walls and ceilings. And even better then that there are two tunnels that are in complete darkness. One is very long and requires you to crawl through it before it leads you into two large rooms. And the other is shorter but involves navigating a stone ladder (with carved out toe and finger holes) at the end of it, which brings you into another secret room. We spend about 30 minutes up there, exploring the different rooms, going through the tunnels over and over again, and taking pictures of one another. But by then it really is time to go because hunger is hitting both of us. 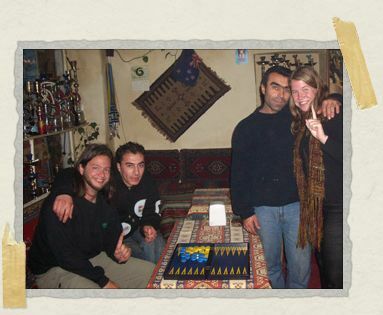 We stop by Mustafa’s place on the way back to Göreme, but are disappointed to see he’s out. Unfortunately we don’t have a pen in our day bag to write a note with, so we head back to Göreme hoping he knows how happy he made us earlier in the day. Back in Göreme, we immediately head to our favorite restaurant, where our waiters/backgammon coaches greet us with huge smiles. We sit and open a backgammon board (there are several in the restaurant), and feel at home surrounded by the smell of Turkish food, cigarettes, and the water pipe that’s being smoked at the cushiony table behind us. Throughout our meal, our waiters sit down with us and advise us on what moves to make on the backgammon board. (Their advising, it should be noted, usually takes the form of them making all of the moves for us. The two of them simply can not resist playing backgammon any chance they get.) The four of us can’t stop laughing as the game proceeds. And as usual, Tim’s coach is giving me a ribbing about always losing, and landing high-fives with his “champion” Tim. But then I discover that Tim’s coach has been cheating like mad, which really makes all of us laugh. After several hours, Tim and I walk back to our hostel. Very tired and sore from crawling through tunnels and over and under trees, we are extremely happy about our day. We smile when we think about having tea in a cave with an adorable Turkish man, exploring an ancient church carved into the side of a cliff, and playing a few swift games of backgammon while sipping Turkish tea. It truly has been a wonderful, wonderful day. #1 Ha Ha! Turkey has been added to my list as well now! Live You! I told ya every Turkish dude looks the same lol Oh Timmy "Love Valley" not that I'm "G"
the way you share it is so marvelous, as are the adventures themselves. You know…just another day in the park. It is beyond charming to meet a moustached stranger who offers you tea and friendship without thought of self. What a wonderful, wonderful world. With your rosy cheeks and friendly smiles, I understand why Mustafa and the backgammon experts welcome you two into their worlds. You look so happy and content, and that kind of happiness is contagious. I love how you guys have really taken the time to enjoy each place and really get to know the area, town, city. Wonderful.